Penzler Pick, July 2001: Working in a mystery tradition that will cause genre aficionados to think of such classic sleuths as Melville Davisson Post's Uncle Abner or Robert van Gulik's Judge Dee, Alexander McCall Smith creates an African detective, Precious Ramotswe, who's their full-fledged heir. It's the detective as folk hero, solving crimes through an innate, self-possessed wisdom that, combined with an understanding of human nature, invariably penetrates into the heart of a puzzle. If Miss Marple were fat and jolly and lived in Botswana--and decided to go against any conventional notion of what an unmarried woman should do, spending the money she got from selling her late father's cattle to set up a Ladies' Detective Agency--then you have an idea of how Precious sets herself up as her country's first female detective. Once the clients start showing up on her doorstep, Precious enjoys a pleasingly successful series of cases. But the edge of the Kalahari is not St. Mary Mead, and the sign Precious orders, painted in brilliant colors, is anything but discreet. Pointing in the direction of the small building she had purchased to house her new business, it reads "THE NO. 1 LADIES DETECTIVE AGENCY. FOR ALL CONFIDENTIAL MATTERS AND ENQUIRIES. SATISFACTION GUARANTEED FOR ALL PARTIES. UNDER PERSONAL MANAGEMENT." This first novel in Alexander McCall Smith?s widely acclaimed The No. 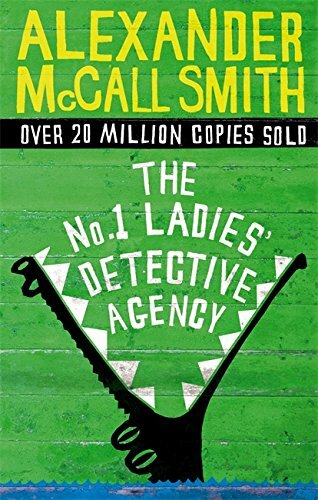 1 Ladies Detective Agency series tells the story of the delightfully cunning and enormously engaging Precious Ramotswe, who is drawn to her profession to ?help people with problems in their lives.? Immediately upon setting up shop in a small storefront in Gaborone, she is hired to track down a missing husband, uncover a con man, and follow a wayward daughter. But the case that tugs at her heart, and lands her in danger, is a missing eleven-year-old boy, who may have been snatched by witchdoctors. The No. 1 Ladies? Detective Agency received two Booker Judges? Special Recommendations and was voted one of the International Books of the Year and the Millennium by the Times Literary Supplement.